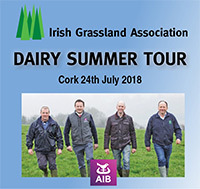 The Irish Grasslands Dairy Summer Tour focused on high profit and high return on investment milk production when it visited two grass based dairy farms at Shinagh Dairy Farm and Rearour, Aherla. The event, sponsored by AIB Bank, took place on Tuesday July 24th. The major focus of this year’s event is achieving a high whole farm profit and converting a leased farm to milk production to achieve a high return on investment. Maximising the use of grazed grass in the cows’ diet featured prominently on both farms.